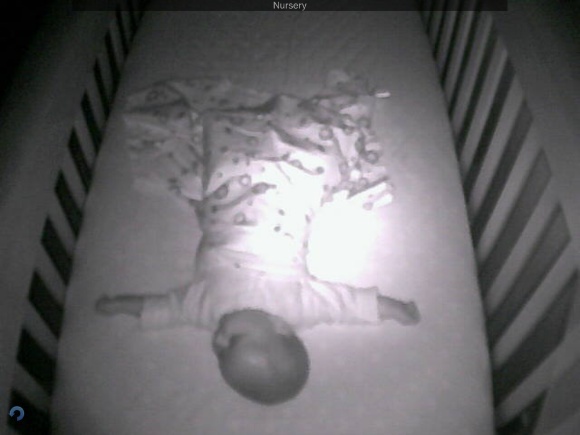 When one has a baby, they quickly realize that baby gadgets/toys/furniture is almost universally horrible. No, honestly. By that I mean that if you think you are “good” or “pro” at putting together IKEA furniture, then you are going to be dumbfounded by the unnecessarily complex procedure that has been “designed” into baby furniture. Anyways, this post isn’t about baby furniture. This is about the iBaby Monitor. This is a video baby monitor that works with iOS and that’s pretty much perfect sounding on the face of it. 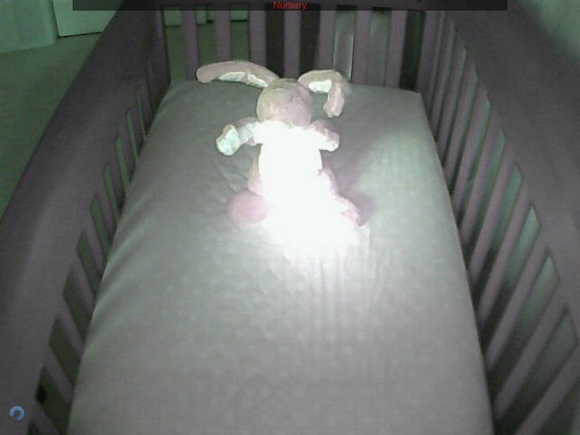 I haven’t tried any other baby monitors, so I can’t say if others are better, but here are my thoughts as a first time parent using this baby monitor. First things first, it’s not a bad looking unit. That doesn’t mean it’s good looking, but for something that I mounted on the wall, white is a pretty good choice. Setup was pretty easy, no Mac needed. Just plug it in via ethernet and boom, good to go. The feed is secured by username and password. Setup is all easy and can be done on your iPhone or iPad. Pan/tilt is great and works. It has never once not worked when we needed it. Push notifications means you can use your phone for other things if you want. The packaging was great, Apple-like. Swiping your finger on the image moves the camera. Ditto the mount for the wall, it feels more like an afterthought. Image quality isn’t great. You can see what’s going on and make out faces, but at night it’s more like shapes. The infrared lighting is nice, but is too concentrated. 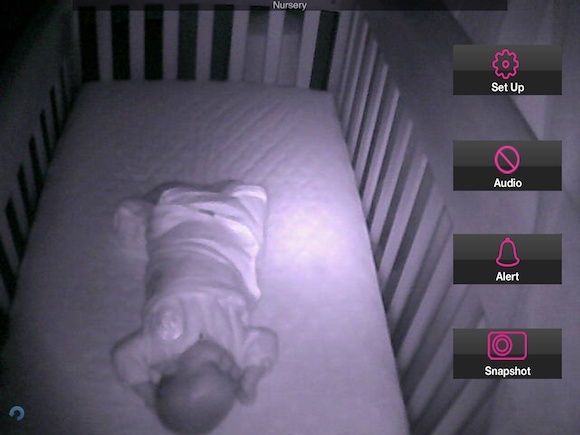 This means that you need to have the baby off center on the screen, or her face will be a white spot. The iOS app drains the battery crazy fast. The iOS apps are crazy ugly. The monitor says it will work over any internet connection (meaning you don’t have to be on the same network to view), but I have yet to get this to work despite forwarding the right ports. The app seems to connect, but never loads an image. It just always works. The power went out, I didn’t do anything, and when the power came back it was still working like normal. I unplug it and move it to another spot in the room, it just keeps working. 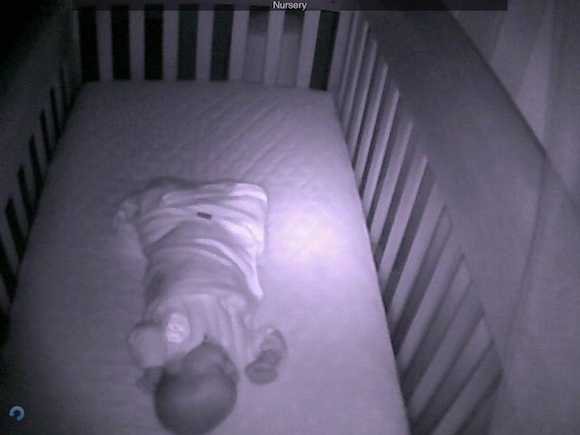 In fact the app is stable and the camera software is stable — that’s probably the most important facet of any baby monitor. It works with iOS and therefore I don’t need to carry anything else with me. I don’t even need to have the app running — it will alert me of movement or sound in customizable settings. I love that I can pan and tilt the camera, because I never have to worry about if we can see her in the camera view or not — we can remotely move the camera to see her if needed. All that said, I wasn’t lying when I said this app drains the battery fast. If you are listening to audio and video, you need your charger on hand. I did find that my original iPad makes for a nice dedicated viewing device (we use it in the living room). For a point of reference this is the only app running on the iPad and the battery drained to 40% in 1.5 hours. So yeah, this app eats batteries. But you don’t need to have it running, so there’s a nice tradeoff there. Even better: Landscape UI, picture only. You can focus the camera manually, but it never seems to be crystal clear for me on the iPad. It’s not cheap either, but hey, I like it.